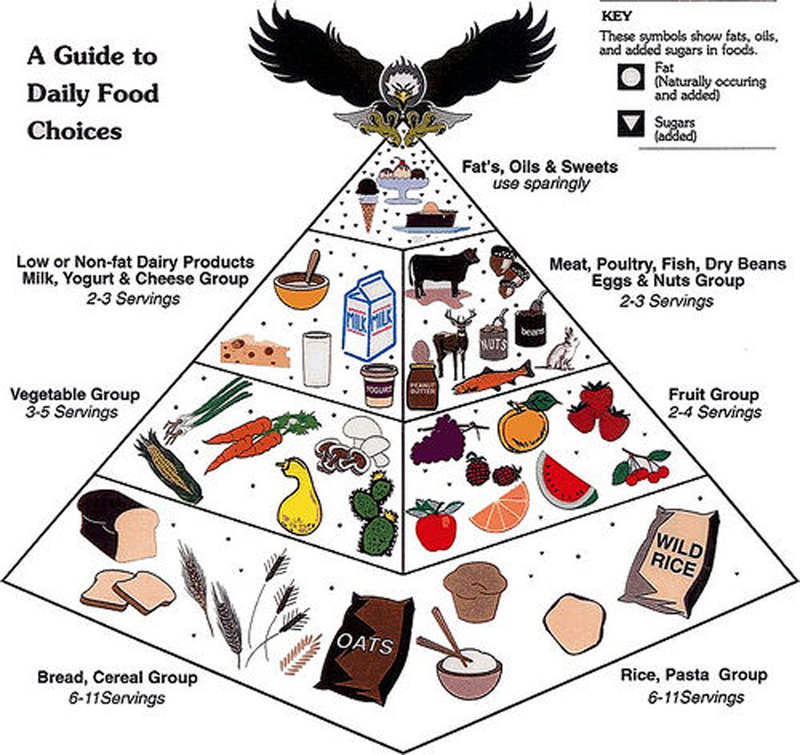 If you took all the food recommended in the "Food Guide Pyramid", and placed it in a trough, hanging around your neck, you'd need to "graze" all day just to consume the amount of food that contains the MINIMUM daily requirements of vitamins and minerals! Less than 5% of us actually eat like this. When you actually ate all those servings, you would have absorbed the vitamins and minerals recommended as the "daily allowance". What few understand is that those "daily allowances" are just the amount needed to avoid getting a vitamin deficiency disease, like rickets. The "daily allowances" are just enough to help a perfectly healthy person stay healthy. Much higher levels of vitamins and minerals are required by growing children, lactating or pregnant women, or anyone who is ill and wishes to recover their health. This is why I say that it is no longer an option to take vitamin supplements. Go easy on fats and sugars added to foods in cooking, or at the table--remember that they are present in butter, margarine, gravy, salad dressing, sugar, and jelly. Choose fewer foods that are high in sugars--eat less candy, sweet desserts, and soft drinks. Sodas are high in phosphorus, and this can leach calcium from your bones. The most effective way to moderate the amount of fat and added sugars in your diet is to cut down on "extras" (foods in this group). Also choose lower fat and lower sugar foods from the other five food groups often. Choose skim milk and nonfat yogurt often. They are the lowest in fat. 1 1/2 to 2 ounces of cheese, or 8 ounces of yogurt count as a serving from this group because they supply the same amount of calcium as 1 cup of milk. Choose "part skim" or lowfat cheeses when available and lower fat milk desserts, like ice milk or frozen yogurt. Read labels. Choose lean meat, poultry without skin, fish, and dry beans and peas often. they are the choices lowest in fat. Trim away all the fat you can see. Broil, roast, or boil these foods instead of frying them. Nuts and seeds are high in fat, so eat them in moderation. Different types of vegetables provide different nutrients. Include dark-green leafy vegetables and legumes several times a week--they are especially good sources of vitamins and minerals. Legumes also provide protein and can be used in place of meat. Go easy on the fat you add to vegetables at the table or during cooking. Added spreads or toppings, such as butter, mayonnaise, and salad dressing, count as fat. Choose fresh fruits, fruit juices, and frozen, canned, or dried fruit. Go easy on fruits canned or frozen in heavy syrups and sweetened fruit juices. Eat whole fruits often--they are higher in fiber than fruit juices. Count only 100 percent fruit juice as fruit. Punches, ades, and most fruit "drinks" contain only a little juice and lots of added sugars. To get the fiber you need, choose several servings a day of foods made from whole grains. Choose most often foods that are made with little fat or sugars, like bread, english muffins, rice, and pasta. Go easy on the fat and sugars you add as spreads, seasonings, or toppings. When preparing pasta, stuffing, and sauce from packaged mixes, use only half the butter or margarine suggested; if milk or cream is called for, use lowfat milk.